This was the first project from this site that I tried, and it came out great. It only cost me the money for the Kreg Jig and the screws, as I already had the wood from some old shelves that I disassembled. The Jig was $20 on Amazon. I used 2 1/2 inch decking screws for the majority of the project, and kreg screws for the pocket joints. I also used TiteBond III Ultimate wood glue (an outdoor-rated waterproof wood glue) to supplement the screws, especially at the top with the pocket joints. 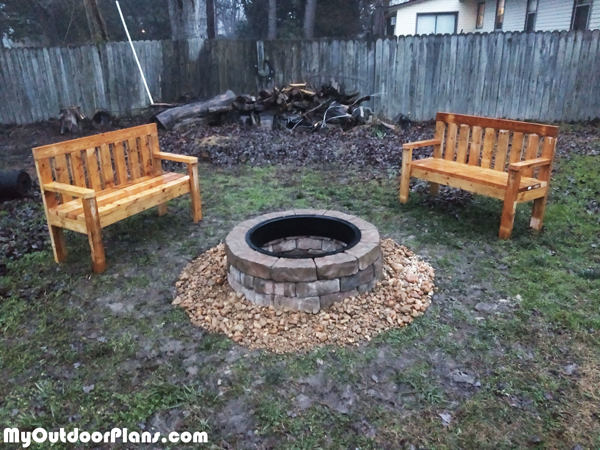 It took me an afternoon to make the cuts and build 2 benches. I sealed and stained them with several coats of a stain/polyurethane combination spray. If I were to do it again, I would make my cuts and then seal/stain the wood before assembling it.